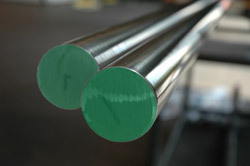 Best Stainless is proud to offer high quality 416 Stainless Steel. 416 Stainless Steel (SS) is a martensitic free machining grade of stainless that can be hardened by heat treatment to achieve elevated strength and hardness. Due to its low cost and ready machinability, 416 stainless steel is readily used in its highly tempered state. It exhibits better machining characteristics than austenitic grades, however, sacrifices corrosion resistance. High sulfur, free-machining grades like Alloy 416 are unsuitable for marine or any chloride exposure situations. We can supply our 416 stainless steel for any project big or small.